This is a C8 Aileron. It costs £194,000 or about US$328,000. That's more than a Ferrari 458. And a McLaren 650S. It has 400bhp, which as you can gather, is less than both the Ferrari and McLaren. According to the internet and YouTube videos I've scrutinised, I also gather that its driving dynamics are not on the same level as the Ferrari and McLaren. Some may even say it is not particularly attractive - that big front grille is too fish-like, those side vents are too bulbous and those headlights are too glitzy. In addition, everybody these days is talking about Ferrari, McLaren, Porsche, Lamborghini, Pagani, Bugatti, Koenigsegg. They are the 21st century's equivalent of the poster - they have become the desktop wallpaper. Everyone wants one, and everybody who can afford one usually has one. (I'm generalising, don't shoot me down pls). If you've made it, you have one of those cars. Knightsbridge, London is a great example to see this. That's why carspotters go there all the time to take pictures of these supercars. I even follow some of these people on Instagram. I see the big shots all the time - Ferrari 458, McLaren 12C, Aventador, Huayra, Veyron and so forth. People flock to see them, and they get all the attention. But the thing is this - I don't care about any of that. Because one thing I've noticed is this - amongst all the Knightsbridge supercar photographs that have graced my retinas, I've only ever seen a Spyker once. But boy did it catch my eye. Sure, based on figures alone, it's down on performance compared to its rivals. But the thing is, a Spyker is not about performance. It's not about speed. It's not about handling. And it's certainly not about lap times. 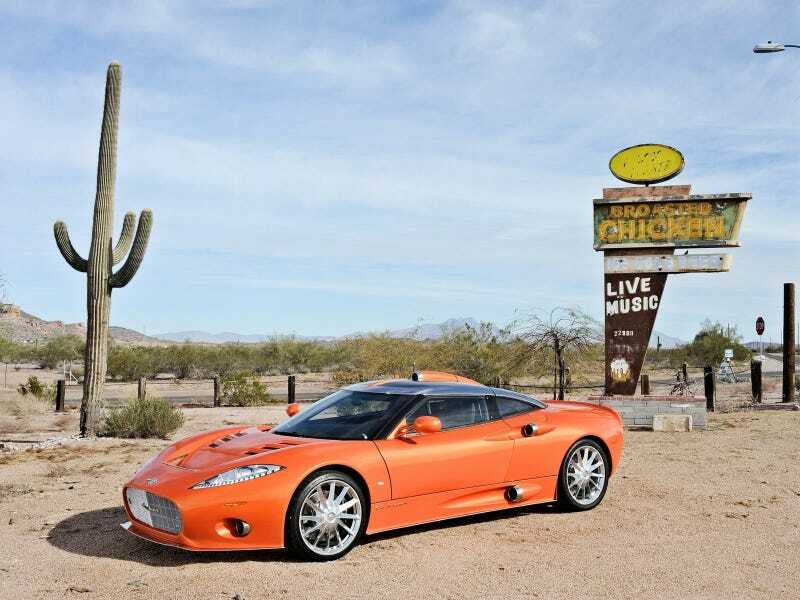 Whereas the competition excels in all things relevant to performance cars, a Spyker excels in something else. Something less physically tangible. It makes you feel truly special. Owning a Spyker shows you have taste. Its competition seems almost vulgar in comparison. They may have the bragging rights to the highest speed achievable along the hangar straight at Silverstone, but none have quite the same magic as a Spyker when parked outside that little restaurant you know that serves some of the nicest food around. A Spyker makes you look and feel totally different from the others. And then there's the interior. Have you ever seen anything as exquisite as that in a modern car before? I think not. That exposed gear linkage. Those green dials. The aluminium. The jet engine-like vents. The chrome detailing. In fact, let's have a look at that gear linkage again. This is a car for people who want to look good doing 20mph, rather than 200mph. A car for people where speed and performance doesn't always matter. A car for people that prefer not to run with the pack and would rather stay out of the mainstream, that mainstream being the heated supercar battle of the 21st century. Its appearance is noteworthy, but not so noteworthy as to be classified as something ostentatious and pretentious - it has real quality and thought to its design. It doesn't shout it with wild colours and shapes, but at the same time, you know it's there. And for those times when you do want to go a little bit faster, that 4.2l Audi V8 is always there to push you where you stylishly need to make your appearance. Yes, it costs more, but what you get in return is one hell of a distinctive car. To me, a Spyker is more an extension of your style, rather than an object that wildly proclaims your wealth and success. And that reason is why I would prefer a Spyker over its rivals. It's different and, it's the word that keeps coming back to me. It's special.